San Mateo, the town where Tutubi needs to finish his business first before really going to sidetrips and interesting places. 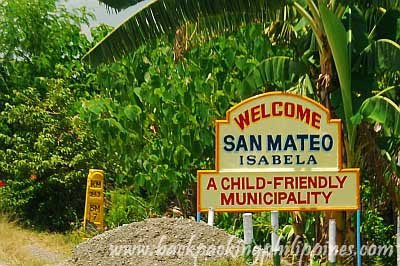 welcome sign of San Mateo town. Notice the 343 kilometer sign post near it. We research led to this webpage for "having won the 2007 Presidential Awards for Child-Friendly Municipality Regional Search – 1st to 3rd Class." All that Tutubi knows about San Mateo is that they take pride in their mongo [mungbean] production and uniquely peach-orange itlog na maalat [salted eggs] colored with achuete. The salted eggs are said to be not too salty with yellow yolk. Tutubi was able to bring home a few kilos of mongo for his mommy but wasn't able to get samples of sa town's salted eggs due to "memory gap." edelweiza, too bad forgot about the salted eggs. will try get samples if my friend goes back there. Child friendly is good. All environments should be child friendly. im erwin,from one of the must proud barangay,SINAMAR NORTE,where people are good,nice,and intelligent.come visit us especially on our munggo festival,summer time and relly you will enjoy your vacation here. will somebody tell me how can i get to san mateo,isabela from manila? and also the munggo,especially when we made the butsi-butsi.hehehe...that the filling is the munggo..LOVE IT!! !